Tomorrow is Nixon's birthday so my blog post will be all about Nixon, so today I thought I'd share FIVE FAVORITES from my week. Pssst...I'll still have the Friday Favorites link-up up tomorrow. Please pretend like Madeley's eyes are open. I took three pictures and this was the best one-even with closed eyes! Last week, Shay and I took these two to get their nails painted. The sweet lady who was polishing their nails got them suckers and made them feel so special. A morning nail date out with these girlies is a FAVORITE! These two friends are another FAVORITE. Last week at dance each day had a theme. Can you guess the theme for Thursday? PINK DAY! I read this book, Gray Mountain, on my flight to Missouri. This book has probably been in my book cabinet for YEARS, but I finally got it out and read it. I'm so glad I did. Reading is definitely a FAVORITE of mine. It's BIRTHDAY WEEK for Ebby Lee and Nixon! On Tuesday, we celebrated Ebby Lee! Nixon had a baseball game so we found ourselves eating a birthday dinner at 8:30. YIKES! 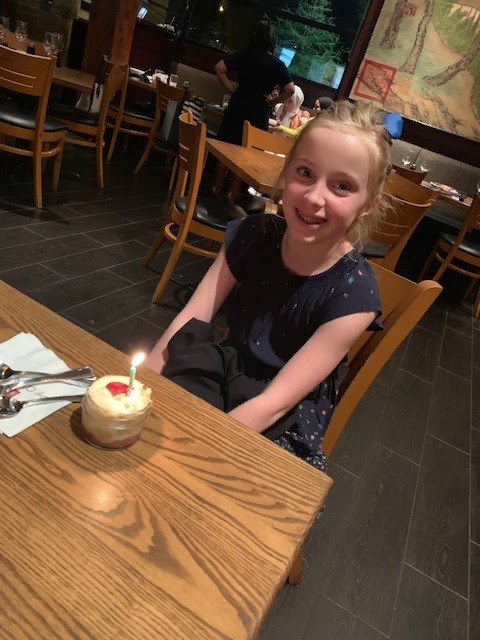 But this girl had a strawberry dessert, presents, and a table full of people who love her-that's what it's all about! Instead of a party, she's opting for a fun night away. Okay, I think that wraps up my FIVE FAVORITES! Come back tomorrow to read all about my NINE-YEAR-OLD! Happy Thursday! They were SO CUTE getting their nails polished!!!! Oh my goodness!! I just love each of these pics. I think the one of the girls in pink is my absolute favorite. So cute!! Britty with her "hands on her hips"...adorable! Mason is so excited about tomorrow night! The hands on the hips kills me!!!! So cute! So cute! Were you on a class field trip at Perot yesterday? I swore I saw you but didn't want to seem like a stalker! I was there chaperoning my second grader's trip!